It seems like a veritable stampede of local food writers and Chowhound posters have made their way to Los Balcones del Peru lately, and I think a good part of the reason is that the Arclight-adjacent neighborhood desperately needed some reasonably-priced new restaurants. We were going to a play, not a movie, but it's a convenient location on the way to anything in Hollywood. When we arrived, it was empty, so surely service would be prompt, right? I hadn't read Jonathan Gold's review first, but I managed to order the dish he raved about anyway, as it sounded like one of the more interesting dishes on the menu. Camarones a la piedra is called a "warm ceviche," but it doesn't really resemble a ceviche -- the shrimp swim in a bright yellow sauce vaguely reminiscent of hollandaise, made with amarillo peppers. 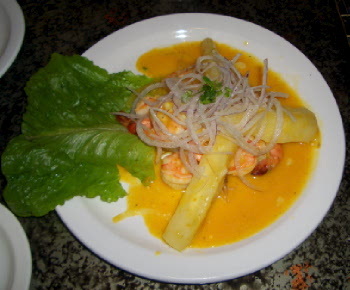 The sauce has corn kernels in it, corn being a very Peruvian ingredient, and the shrimp are surrounded by batons of yuca. The whole thing is covered in finely sliced red onions. It was an interesting combination, definitely different from any other cuisine, yet it needed a lot of the spicy green aji sauce to really bring out the flavors. Matt had the saltado mariscos, which was sauteed calamari, shrimp and tomatoes on a bed of french fries served with rice, and pronounced it excellent. The fries I stole were indeed tasty. Some of the dishes have combinations that sound rather odd -- there were a few that combined bananas, eggs, steak or chicken and potatoes, I think -- but it all makes for a good change from the typical Mexican or Brazilian menu. They had a nice-looking flan for dessert, but we needed to make an 8:00 curtain, so I took one of the alfajores cookies to go. My car is now covered in a snowdrift of powdered sugar, but those things are amazing. Two nice big butter cookies enclose a thick layer of dulce de leche, but somehow the whole thing isn't too cloyingly sweet. One cookie is enough for two to share, though. The verdict: The price was right ($33 for two entrees, three soft drinks and a giant cookie) and there are some interesting dishes I've never tried before. Unfortunately, the service was extremely slow and not particularly attentive -- it would have been nice to have more bread to sop up my yellow sauce, Matt's second soda didn't arrive until he was nearly finished, and I was never offered a refill on my iced tea. If you're trying to make a movie, it's probably a good idea to let them know as soon as you arrive. Still, it's good to have another option in the area. Yes but better than Mario's down the street on Melrose and Vine? That's the real question. Mostly yes, with the exception of the Saltado de Mariscos, which is Mario's signature dish and less fishy there than at Los Balcones. Otherwise there's no point in waiting in line at Mario's b/c everything else is much more zesty and friendly at Los Balcones. Personally, I think its great. I defanitley dont think its fishy at all, its actually very fresh and the service is wonderful. The owner is great and the waitresses are very friendly and warm. It's as close to Peru as I've had since I've been to Peru...and thats saying a lot. Next to of course, my mothers kitchen. Terrible non-experience. After looking for an authentic Peruvian restaurant, my family and I (7 in all, 2 small, but well behaved, children) showed up famished and ready to be reminded of our great trip to Peru last year. We were greeted at the door with a definitely oppressive fishy smell and a host who said categorically that he would not be able to seat us all. After glancing over the room I suggested that he push a couple of the several empty tables together to make space, a reasonable request in any restaurant. The host was not willing to do his job and would not accomodate us. Perhaps he did us a favor. Considering the attitude of the wait staff I would not recommend this restaurant to anyone. Balcones del Peru is by far the most authentic in LA. I am always greeted with a warm smile and a "bienvenidos" at the door. I am Peruvian and it has taken me a long time to find a place that I can call mom and dad to brag about and tell them how close to their home cooking there food is! I love the resonable prices and am actually going there tomorrow night for my birthday. I would pick this place over Mario's in a heartbeat.